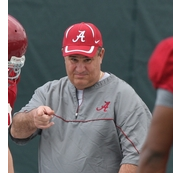 Crimson Tide outside linebackers coach Sal Sunseri, is one of five finalists for the Frank Broyles Award. The award goes annually to the nation's top assistant coach. Alabama defensive coordinator Kirby Smart won the award two years ago and Auburn offensive coordinator Gus Malzahn won it last year. 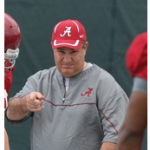 Sunseri who has two sons playing collegiate football, has been on the Tide staff for the last three years. His youngest Vinnie is a freshman at Alabama. The winner will be announced December 6th in Little Rock, Ark.